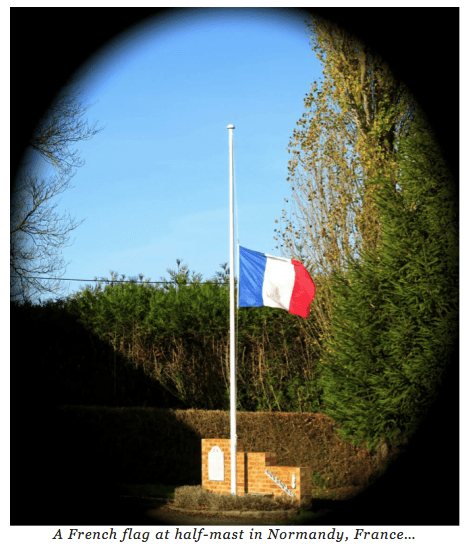 NORMANDY, France – Grim news. Many thanks to all friends and readers who wondered about our safety on Friday. 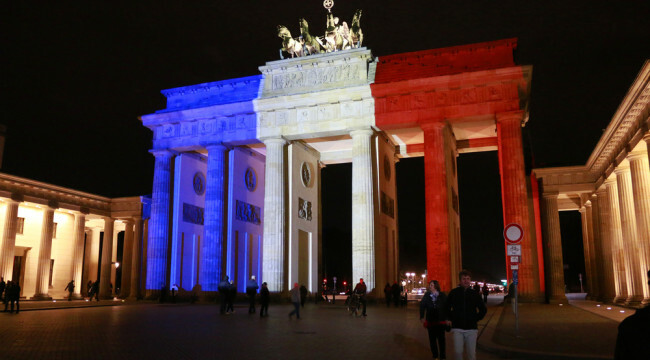 As it happened, news of the Paris massacre got to the homeland faster than it got to us. We were already driving out of town when the terrorists attacked. We did not find out about it until we checked in on the markets. “Paris attacks” were blamed for a 203-point drop for the Dow, we discovered. Later, we read the details. The War on Terror is in its 14th year. There is no sign of victory for either side. And now we see the familiar pattern. The body count went up. The flags went down. The fever mounts. “We shouldn’t have let them into our country,” said an outraged neighbor. “War is the health of the state,” wrote Randolph Bourne. Today, French shoulders slump and hearts ache. But the French feds have rarely felt better: France is at war. Hollande last made international news by sneaking out of the presidential mansion on a motor scooter to visit his mistress. Now, he’s able to strike a more leader-like pose. Paris is locked down. Borders are secured (although one of the terrorists apparently got through to Belgium). And then France’s war planes were started up and sent to bomb Raqqa, in northern Syria – the Islamic State stronghold where French security services believe the massacre was planned. As massacres go, the Paris massacre was a smallish affair. The Soviet secret police, the NKVD, massacred as many as 22,000 Poles in the Katyn Forest in 1940… supposedly to eliminate the Polish “intellectuals” who might oppose the Soviet occupation. In 1944, a Waffen-SS company massacred 642 men, women, and children in the village of Oradour-sur-Glane in Nazi-occupied France… including 205 children. The exact cause was never discovered. And in 1572, the St. Bartholomew’s Day Massacre, in which French Catholic mobs cut down Huguenots (French Calvinist Protestants), produced about 3,000 corpses in Paris and as many as 70,000 across France. Pope Gregory XIII was delighted. He had three frescoes painted in the Sala Regina in the Vatican to commemorate the great event. The room is now closed to the public. What leads people to massacre one another? Envy, hatred, fear – the usual base emotions? Psychologists blamed the My Lai Massacre on “prolonged fear.” It supposedly caused American soldiers to crack up. The Catholic violence against the Huguenots in France was part of the religious wars that rocked Europe in the 16th century. But the Catholic mob was stirred to action, according to some accounts, by particular circumstances: Harvests had been poor. Food was expensive. Taxes were heavy. And there, in their midst, were rich Protestants in all their finery, who had come to celebrate the marriage of Margaret of Valois, sister of Charles IX, to Henry of Navarre, a Huguenot. Our Diary dictum: People are sometimes bad and sometimes good, but always subject to influence. War, as near as we can tell, is always a dangerous influence.